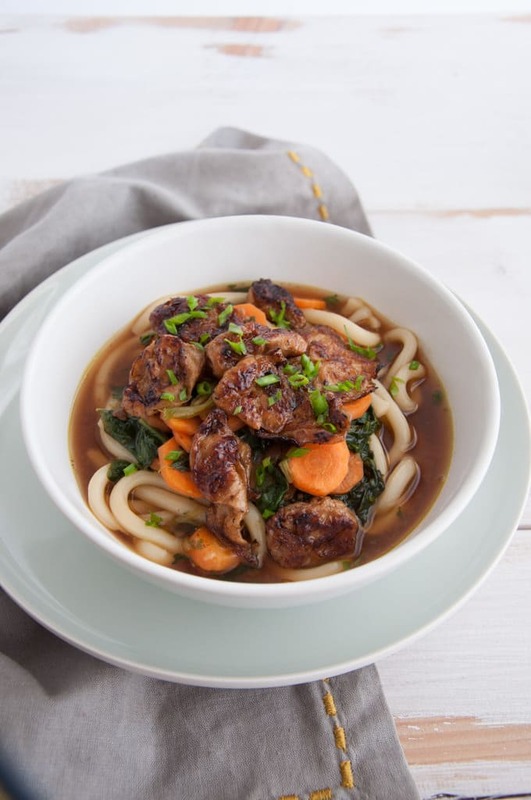 This vegan Miso Udon Noodle Soup is perfect for the colder seasons! It’s warming and delicious. Mock Abalone makes the perfect topping! After riding my bike to work in the rain I knew the day would be perfect for a hot udon noodle soup. 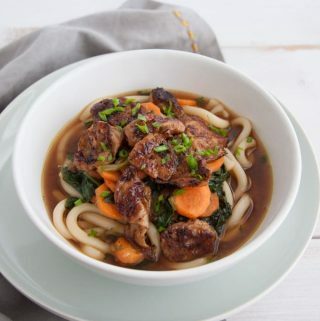 This vegan Miso Udon Noodle Soup with Mock Abalone is my go-to soup. I eat it pretty much all winter long and it keeps me going. So good! I added some miso paste, which I found just recently in an asian market. I still remember asking the owner about miso paste a few months ago and now he has a whole section of it! How cool is that? The mock abalone I used is super soft and delicious. I’ve never tasted real abalone so I don’t have any comparison if “it’s the real deal” but it’s perfect as it is. I like the squishy consistency of the mock abalone because it is the perfect addition for the soup. 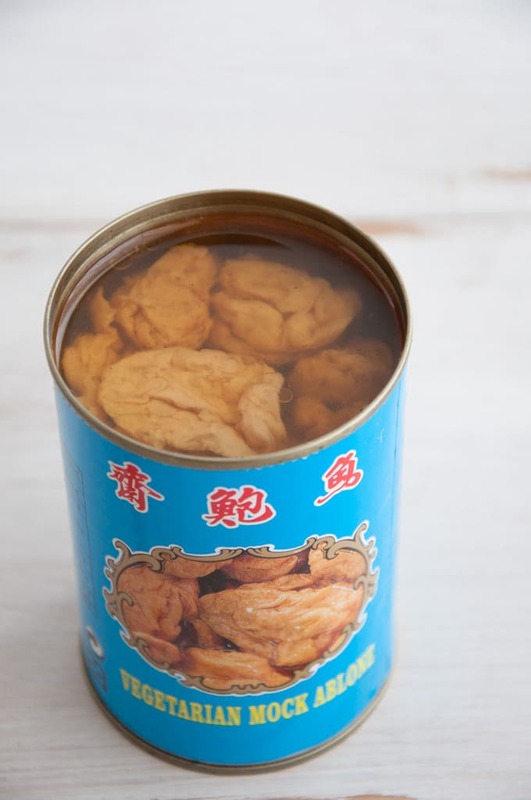 Recipe for a vegan Miso Udon Noodle Soup with Mock Abalone. Perfect for the colder months - very comforting and delicious. With carrots and spinach. Wash and chop the carrots. Wash the spinach. Heat 1/2 a teaspoon of sesame oil in a large pot and add the chopped carrots when it's hot. Add a splash of soy-sauce and the baby spinach leaves and give it a good mix. After 3-4 minutes add about 2 cups of water. Let it cook on medium-high heat for about 10 minutes. In a small bowl or cup fill a few tablespoons of the soup and mix in the miso paste until it dissolves. Then pour the mixture back into the pot. Add the udon noodles to the soup. Add more soy sauce to taste. I used low-sodium miso paste, so it really depends on the ingredients you're using. Meanwhile sauté the mock abalone in a separate pan until it gets a nice brown color. 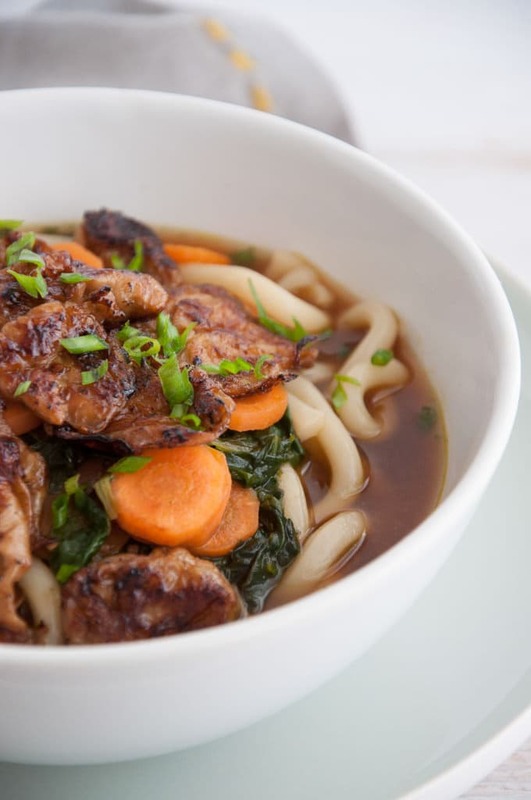 The soup is ready to serve when the udon noodles are soft and don't stick together anymore. Place the mock abalone on the soup and top it with the finely cut spring onions. I bet this tastes amazing after a cold rainy bike ride. I’ve had mock meat from a can before but I don’t think I’ve had the abalone. It looks good! Thank you Bonnie. The abalone is quite different from other mock meats like mock duck for example. It’s softer and a bit more “squishy”… perfect as a soup topping. This looks really good. I have a question about the mock abalone. Is it soy based? I have a soy allergy, so I have to be careful when it comes to vegetarian foods, which makes it difficult to go as vegetarian as I’d like to. Is there a substitute I could use, like portabello mushrooms? Thanks! If I can’t find the mock abalone how do I prep the mushrooms?